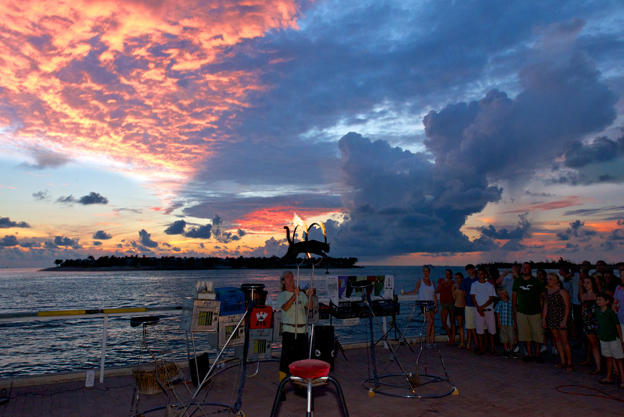 The famous nightlife that defines Key West is reason enough to visit the island paradise. But did you know that same unique party atmosphere also extends earlier into the daylight hours with happy hours and a sunset celebration? 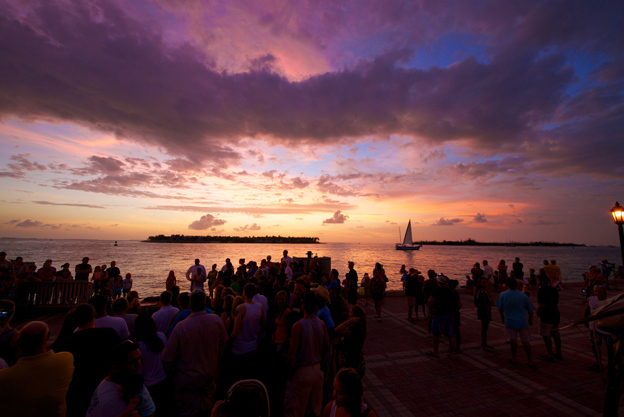 Whether it’s a full-on “Duval Crawl” or a frozen drink by the marina watching the sunset, here’s your ultimate guide to nightlife in Key West. This is the classic bar for watching the famed Sunset Celebration in Mallory Square. Extending down a pier at the Ocean Key Resort with pastel stools overlooking the harbor, guests can order a piña colada and snack on a lobster roll while taking in the sunset. Another waterfront option for the sunset is the Tiki Bar at the Galleon Resort and Marina. While it’s located inside a hotel, it’s open to everyone and is a popular spot for locals at sunset. Don’t pass up the bar’s great happy hour. Pull up a stool at one of the largest al fresco bars in Key West and kick back with live music performed right on the marina. Enjoy 2-for-1 drinks from 4 to 7 p.m. where the bartender gives you a token with your first drink that you can redeem for your second that day or during happy hour any other day. Just down the seaport from Conch Republic Seafood Company is where you’ll find Alonzo’s Oyster Bar. Its appetizer and drink menu is 50% off from 3:30 to 6:30 p.m. Try the buffalo shrimp, oysters Rockefeller and a ginger mojito. Escape the hot sun with a retreat inside the dark and cool Lazy Gecko on Duval Street for 2-for-1 drinks from 5 to 8 p.m. And if a frozen drink is more your flavor, they’re $1 off. Expect live music around this time with a more high-energy party with a DJ come nighttime. 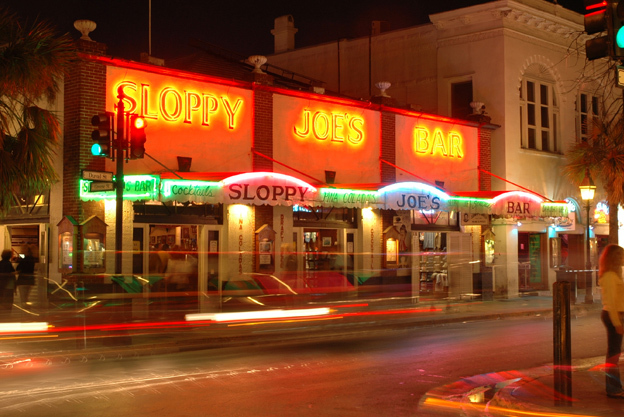 Sloppy Joe’s is easily Key West’s most famous bar. At the foot of Duval Street, there’s live music blaring from the stage at all hours of the day and night. Whether it’s country, rock, punk or blues, there’s always a lively crowd singing and dancing along at Sloppy’s. This Key West landmark is easily the most beloved bar by Conch locals. The Green Parrot hosts a diverse and talented roster of musicians for live shows on the weekend. From jam bands to jazz and funk, the Green Parrot also has one of the best jukeboxes on the island when the band’s not playing. Visitors who like to party can’t resist Irish Kevin’s and its roster of entertainers and musicians. They’ll not only play the cover songs you want to hear, but they also know how to get the crowd involved and revved up to party. Hidden down a small alley off Duval Street, the al fresco Smokin’ Tuna Saloon has become a preeminent venue for live music. They’re one of the main sponsors of the Key West Songwriters Festival and they attract top singer-songwriters year round. This is Key West’s ultimate dive bar and the irony is that it’s tucked away on the property of one of the island’s nicest resorts. At the Chart Room, expect a dimly lit bar, walls lined with nautical flags and old photos and model ships strewn about. At Chart Room, not only are peanuts and popcorn free, but so are hot dogs! On Truman Avenue along the perimeter of Old Town, Don’s Place is a heavy drinking dive bar that’s open nearly around the clock. If you’re craving an early morning drink, belly up to the bar with the regulars. One of Key West’s most historic bars is still a little divey. Captain Tony’s Saloon is the site of the original Sloppy Joe’s, where Earnest Hemingway used to carouse. Today, it’s a dark den with some of the strongest rum punch in town. Located on the Historic Seaport, Schooner Wharf is easily the diviest of the cluster of bars found here. It’s a true taste of Old Key West where you’ll find boat crew and fishermen hanging out after a day on the water with a cold, cheap beer. 2 Cents is one of the most gastronomically creative restaurants on the island and it’s garnered a strong local following. For that reason, it also has a lively bar scene with drinks crafted by some of the top mixologists in Key West. If you’re just looking for a quick bite in-between day drinking and night drinking, stop by this Historic Seaport gem. The tastes of Old Key West are alive and well with fresh fish sandwiches, tacos, and elevated local street food. Hog’s Breath is a classic Key West bar with great live music that also has a sprawling restaurant with tasty bar food, like the Hog Dog with chili and cheese. Located in the heart of Duval Street, Willy T’s is an open air bar and restaurant with great live music at most hours of the day. They have everything from fresh fish sandwiches to delicious pasta dishes. A patio at the rear of the Italian Restaurant La Trattoria, Virgilio’s is a martini bar with live music and a high-energy scene, especially Monday nights when martinis are only $5. The Marker Key West is the island’s first new build hotel in 20 years. With a prime location by the Historic Seaport, its pool bar is a great spot to get the night started. The Gates is a newly opened hotel located in New Town with a buzzy pool scene. They have a great outdoor rum bar and food truck to keep your taste buds satisfied.